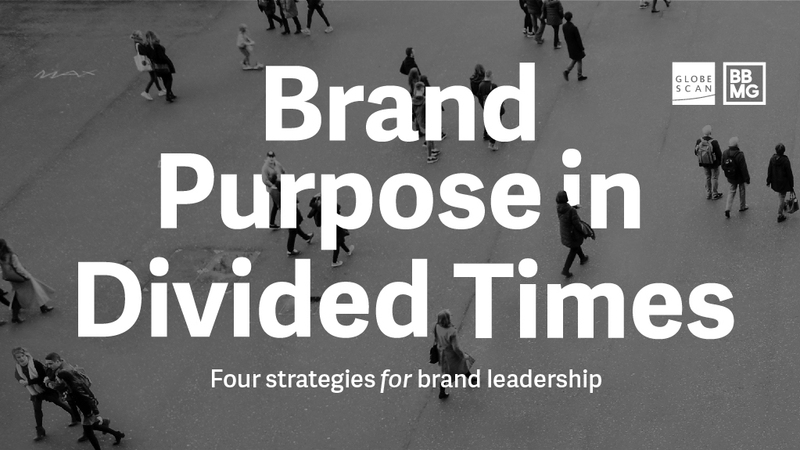 In the report Brand Purpose in Divided Times, BBMG and GlobeScan build on six years of global consumer insights to reveal the unfiltered needs and desires of 16,000 consumers across 16 countries. Through in-person and telephone conversations, we listened to what people are feeling now and what they desire for their lives, their families and their communities. And in the context of these dynamic tensions, we share best practices for how brands can connect more authentically to consumers’ aspirations for a better life and unlock more meaningful relationships, loyalty and participation. As you will discover in this report, we may be feeling more divided than ever. Yet the path to brand relevance and resilience is recognizing what we have in common. For a deeper look at the global data and for inspiration from some of the brands leading in today’s divided times, click here to download our report.